I just sent the following note out to Shion beta testers. The gist: I recently joined a Chicago startup working to help consumers find better electricity plans, monitor their power usage, and to become better power consumers. That work has gone extremely well, and the company will be sponsoring Shion for the indefinite future, which allows me to make the full set of Shion tools completely free to interested users, including the online service. Read more to review the letter. I want to apologize for the radio silence over the past month. I’ve been hard at work at my new company and I’ve been working hard to add new features & devices to Shion. This post shares some of that work. This release of Shion Touch includes updates for new beta testers. This has been a good week for Shion development. 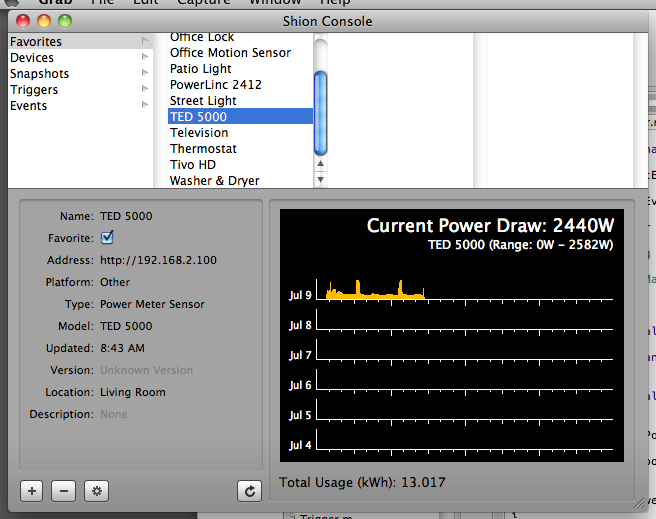 In the past few days, I’ve added support for Morning Industry computer-controllable locks using the MorningLinc, I’ve been tracking the power consumption of my washer & dryer combo unit using Shion’s new support for the iMeter Solo, and yesterday evening I added support for the TED 5000 smart meter. Despite its early stage of development, the TED 5000 may be one of the better devices I’ve had the pleasure of supporting in Shion. There was an initial struggle installing the thing (it doesn’t have WiFi and can be picky about which power outlet it can use to communicate with the hardware in the breaker box), but once I had it working, adding support was simple. It uses a simple & straightforward XML API for communicating its readings, and those readings are probably being updated more frequently than I’ve designed the Shion events infrastructure to handle. Using the code I wrote for the iMeter earlier this week, I was able to get Shion talking to the meter with full graphing in less than an hour. The major reason that I wanted to support this uint was to begin building a model of my electricity consumption on a per-device basis. Since it isn’t feasible for me to connect an iMeter or SynchroLinc to every device, I’m planning on using Shion’s stored state to generate statistical models that describe how much each device contributes to the overall power draw. Device states go on the left-hand of the equation, the total power draw goes on the right-hand side of the equation, and I run a simple linear regression to get the coefficients. That’s the theory & plan and I’ll be posting some entries later over the next couple of weeks describing how it works in practice. One bit of new information that I discovered was the huge power draw that the air conditioner used. From my rough readings, my home has about a 400W “base” draw consisting of various appliances & computers that are left on at all times. When the air conditioner starts, it adds 1800-2000W to the power consumption, far dwarfing the other devices. I expected a major power draw, but not one that quadrupled my overall consumption! Since my Venstar Insteon thermostat only reports mode, set points, and temperature and NOT if the unit is running, I’ll have to get creative in my statistical modeling to associate more closely the observed power draw with the the spikes in electricity consumption. I have several ideas about how I might accomplish this, and will be posting updates in the weeks ahead. Stay tuned. Shion 3.0β9 is now available. 2. The Bluetooth, and GPS have not yet been implemented. 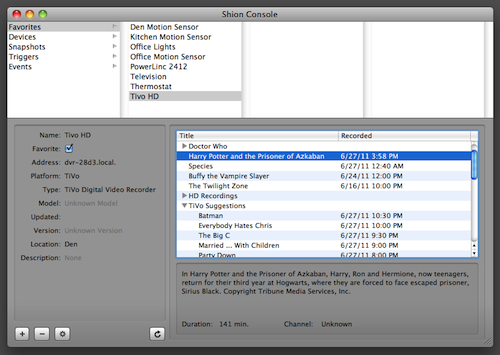 This release fixes a handful of issues & adds support for TiVo DVRs within Shion and Shion Touch. To add a TiVo to Shion, add it from the “Add” button on the lower-left, select Device: Other: TiVo Digital Video Recorder. An add menu will appear and Shion will attempt to locate the device using Bonjour. If the address does not automatically appear, please manually enter the device’s IP address (this can be found in the TiVo setup screens). You will also need to locate your Media Access Key from your account settings on the TiVo website. The Tivo interface only displays recordings on the device. I have an API for emulating a TiVo remote control, but have held off in including it in the interface as I work out an appropriate interface. If controlling your TiVo from Shion (or Shion Touch) would be a useful feature, please let me know in the comments below.